This article will describe a configuration of Virtual Private Network connection by using an OpenVPN application. Firstly, you will be exposed to some basic theory behind Virtual Private Networks. Then, the article will guide you with step-by-step instructions on how to setup a OpenVPN virtual private network by using Symmetric Key Encryption and Public Key Encryption. This article is meant for everybody who possesses a basic knowledge of linux administration and networking. VPN networks are often operated as client-server applications. Good example could be an implementation of MS Windows PPTP or OpenVPN on the Linux Platform. VPN server is directly running on a firewall, where it creates virtual network interface and additional virtual network subnet. VPN server is waiting for connections on the external network interface of the firewall where it performs authentication of a VPN client application. After successful VPN client authentication a VPN client is given an IP address from a virtual subnet. Consequently, an encrypted tunnel is created between VPN client and VPN server, which is used for safe transfer of packets between two distant networks via the Internet. Services, which a VPN client can connect to, can furthermore be defined by firewall rules. 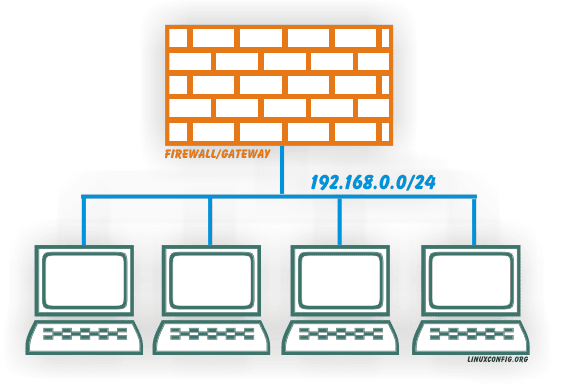 This way firewall ensures that VPN client can connect only to services it is allowed to connect. If the previous couple sentences looked to you little difficult to understand, do not despair! Everything will become clearer once we see how encrypted tunnel works in an example. VPN tunnels are generally considered as something mysterious and everybody who mentions them, is "cool" :-) However, there is nothing to be afraid about, in the fact principle of Virtual Private Network is very simple. Data in IP networks are exchanged in packets. Information about destination and a source of the packet can be found in the packet's header. The actual user data are carried as a payload. Let’s imagine that ssh client wants to talk to ssh server over the Virtual Private Network. Packets leaving a host's network interface located on the local network are sent with a destination port number 22. When this packet reaches a VPN tunnel it is encapsulated into the VPN packet where original packet is now treated as a payload. If the VPN server listens on the port 443, the VPN packet will carry a destination port 443. When looking at the previous figure it is apparent that this kind of network data transfer over the VPN is a waste of transfer rate because original packet has a smaller payload space just because it needs to fit into the VPN tunnel packet. In VPN analogical sense this can be considered as a drawback. In case that an employee wants to connect to some company's services from outside world, his/her attempt would be rejected by the firewall. Not just because this attempt is coming from completely different subnet but also because the ports to the particular services are not open. Once the VPN server starts functioning on the gateway, it automatically creates a virtual network interface with subnet 192.168.2.0/24, which would then start accepting a connection from external network. Once employee passes VPN server's authentication, a VPN server will assign an IP address from a 192.168.2.0/24. For 192.168.1.0/24 hosts would be the systems on 192.168.2.0/24 network appear that they are located on the separate local subnet, but in fact the communication is done by encrypted VPN tunnel over the Internet. The following image will try to explain fundamental principles of VPN server-client communication. The gif animation will change every 14 seconds. The aim of this animation is to explain a logic behind a VPN communication in simplest form as possible. Please note, that there are many other factors behind the scenes which had been for the sake of simplicity omitted. 1/14: VPN Client establishes a connection with a VPN Server via external network interface. 2/14: VPN Server assigns IP address to a vpn client from a local virtual subnet 192.168.2.0/24. 3/14: VPN Client prepares a packet for a host 192.168.1.3 located within a private subnet 192.168.1.0/24. 4/14: VPN Client encrypts and hides an original packet inside the outer public packet. 5/14: The packet is dispatched by the VPN client via public network to the VPN Server. 6/14: A network packet acquired from the public network is decrypted and decapsulated by the vpn server. This way VPN server obtains a packet for the private network. 7/14: VPN Server handles a newly acquired packet as it was sent locally on a 192.168.1.0/24 subnet. 8/14: Packet is delivered to the host with destination IP address 192.168.1.3. 9/14: Host with IP address 192.168.1.3 creates a network packet with destination IP 192.168.2.2. 10/14: VPN Server receives a reply packet. 11/14: According to the VPN Server's routing table, this packet links up with the Virtual Private Network. 12/14: VPN server encrypts and hides an original packet inside the outer public packet. 13/14: The packet is dispatched by the VPN server via public network to the VPN client. 14/14: The network packet acquired from the public network is decrypted and decapsulated by the vpn Client. This way VPN client obtains a packet from the private network. This type of communication requires a one symmetric key which will be used on both sides to encrypt a message and this way preventing an interceptor to read a message. To do this, symmetric key needs to be produced and exchanged between both sides. This means that both sides will use the same encryption key to encrypt as well as to decrypt sent and received messages. Now, that we have grasped a necessary theory about Virtual Private Networks, we can move on, and explore all mandatory steps for creating a VPN connection with Symmetric Key Encryption and Public Key Encryption. As a starting point in both cases there will be two computers with fresh Debian Linux installation. How the connection between those two PC's is created is not important. The connection can be done via cross-over cable, two bridged virtual machines or over the Internet. What is important, is that both PC's can ping each other and VPN Server will have 1194/UDP port open for connection from a VPN Client. In the further text we will refer to these systems as a VPN-Server ( IP Address: 10.1.1.3 ) and a VPN-Client ( IP Address: 10.1.1.4 ). A VPN tunell will be created as point-to-point 192.168.0.1 - 192.168.0.2. However, for VPN tunnel created with use of Public Key Encryption ( OpenVPN certification mode ) the client's IP address will differ and will be assigned from 192.168.0.0/16 subnet IP address pool. In our case the client will obtain a IP address 192.168.0.6. OpenVPN application consists only from one binary file which name is equal to the application name itself, thus openvpn. This binary file is used to start an OpenVPN server as well as OpenVPN client and therefore it is important to install the same OpenVPN packages on both sides. To be more precise, a difference between an OpenVPN Server and OPenVPN Client is just in how the configuration is carried out on both sides. It is recommended to install OpenVPN packages from the official repository of your Linux Distribution you intent to use for this purpose. If, from some reason the packages for OpenVPN are not included in the official repository of your linux distribution feel free to install from source code. Both installations will be briefly covered in the following paragraphs. Repeat a following installation steps for vpn-server as well as a vpn-client. 0 upgraded, 2 newly installed, 0 to remove and 19 not upgraded. Need to get 397kB of archives. After unpacking 1114kB of additional disk space will be used. Apt-get will automatically fetch required prerequisites as in this case it is a liblzo2-2 package. What happens here, is that openvpn binary file will be created by the source code compilation and installed in a /usr/local/sbin directory. eth0 interface directly represents a hardware device, which can be, for example a PCI network card. On the other hand, TUN/TAP devices represent a virtual network interface. Packets traveling via TUN/TAP interface are sent to the application before they reach eth0 network interface. This allows an application such as OpenVPN encrypt or decrypt packets before they reach a physical network. Almost all configuration settings can be passed to the OpenVPN application via command line. Another option is to create a configuration file which will be read during the OpenVPN initialization. Creating a configuration file is a clean way to maintain a Virtual Private Network connection settings, since the number of outgoing connections can grow where the only limits is just a robustness of your system. However, for sake of simplicity and transparency in the following example we will use command line parameters to configure an OpenVPN server. port number assignment by IANA. OpenVPN 2.0-beta16 and earlier used 5000 as the default port. OpenVPN server and client now uses a tun0 virtual network interface to maintain a encrypted virtual tunnel connection. OpenVPN server's tun0 interface is set to 192.168.0.1 and OpenVPN client's tn0 interface is set to 192.168.0.2. If everything went smoothly and there is no firewall set between both endpoint which may interfere with the VPN tunnel, it should be easy to confirm a VPN connection with ping command. If at the same time we would start a tcpdump program on the OpenVPN client's virtual tun0 network interface we see an ICMP packets transmitted by ping program, including a replay packets. This output from a tcpdump program can be used as a proof of what we have learn previously, that a packets from a virtual tun0 network interface are encapsulated into public network packets and are sent to the recipient encrypted via single 1194/UDP port. Previous VPN tunnel example used a number of arguments and parameters passed on the command line to create a VPN connection. Although, almost every OpenVPN configuration directive can be passed to the openvpn command from the command line, this can sometimes become a very tiresome work. Therefore, we should complete this section on how to create a VPN connection using a Static Symmetric Key and OpenVPN configuration files. Here is a solution which involves a configuration files to achieve the same goal as shown previously. keepalive - keep connection alive by sending a regular ping packets, in our case the ping packet is sent every 10 seconds where reply packet must come within 60 seconds otherwise assume that the other endpoint is down. ping-timer-rem - should be used only on VPN server side where daemon started without explicit remote IP address, this way timeout starts only after VPN client connection. Now, that "openvpn" group is ready we can create a "openvpn" user. To avoid a public key exchange chaos when using a mesh like model, we could delegate one employee as a Certification Authority ( CA ) who will be responsible for keeping a record of all public keys. The aim of CA will be to collect all private keys from all employees and sign them with CA's private key - to issue a certificate. If anyone would like to confirm a document's signature created by any other employee, s|he would first use a CA's public key to confirm a sender's public key ( certificate ). Once the sender's public key is confirmed, this key can be further used to confirm a signature of the actual document. Since every peer sends it's own CA signed certificate, only what needs to be done, is just to redistribute CA's public key to every employee. and that username "openvpn" and "openvpn" group does exist on both endpoints ( vpn-client and vpn-server ) of your future VPN connection. The following linux command will generate a CA self-signed certificate and private key. Which is all what we need, in order to be able to sign CSRs. Our CA is ready, so at this point we need to create a Certificate Signing Request for our vpn-server and vpn-client. You will be asked to enter some details in regard to your company. It is important that "Common Name" reflects your IP address or a fully qualified domain name (or FQDN) of the system the certificate is intended for. Both Certificates Signing Requests are waiting to be signed.